Trips to the health club require a lot of time and money, so more and more people prefer sports home. 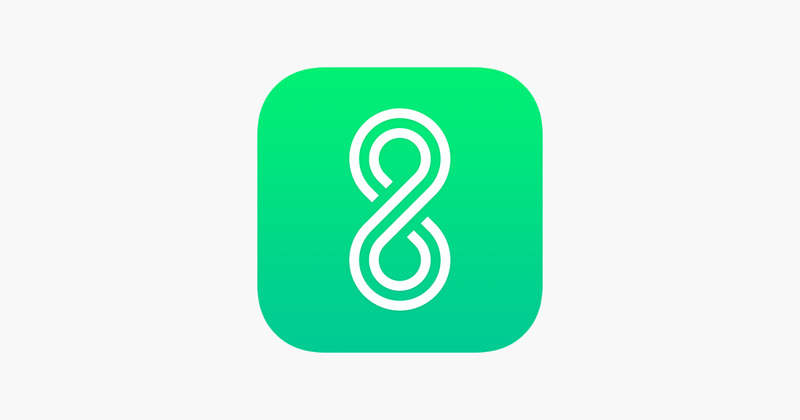 For this ideal 8Fit app that will replace and personal trainer, and gym. In fact, 8Fit is the home trainer: download it on iPhone, iPad, Watch, or iPod, the user will be able to create your own exercise program. The application must specify your height and weight, and also set the ultimate goal of exercise: to lose weight, gain weight, increase muscle, etc. Based on individual parameters of the body and the desires of the user, 8Fit creates a unique program of workout. The load can be adjusted as needed. 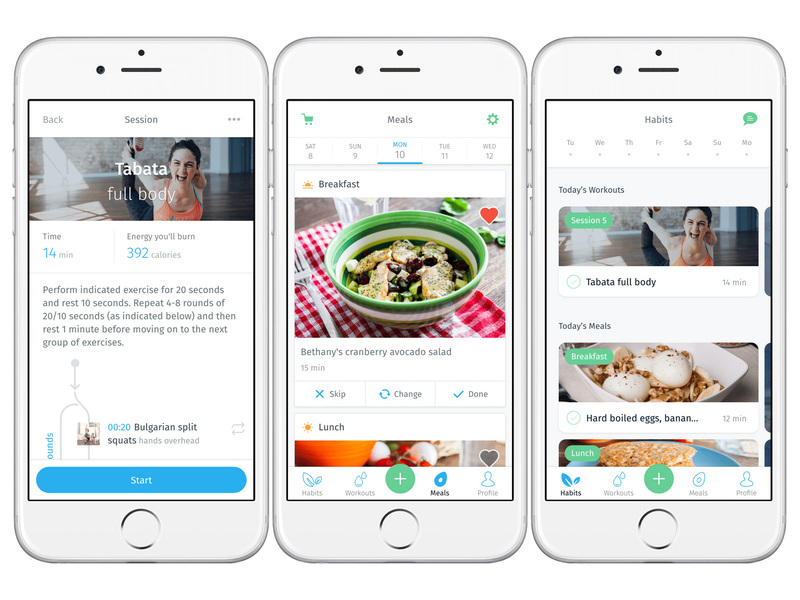 In addition, the app allows you to adjust the diet of the user, given the calories and the amount expended on the exercise of power. Most exercises are accompanied by short videos. Despite the fact that at the Apple Store all information is presented in Russian, in the application itself uses only English that inconvenience and misunderstanding some of the functions of the program. 8Fit convenient for those, who only begins to engage in sports in the app, you can choose the degree of difficulty of exercises and the number of them. Completed exercises are marked in a special calendar at the top of the screen under “Habits“. When regularly undergoing training offered by 8Fit, in the user profile is generated by a special tape with the dates, which reflects how often he goes in for sports, in what quantity and how it is successful in achieving its result. 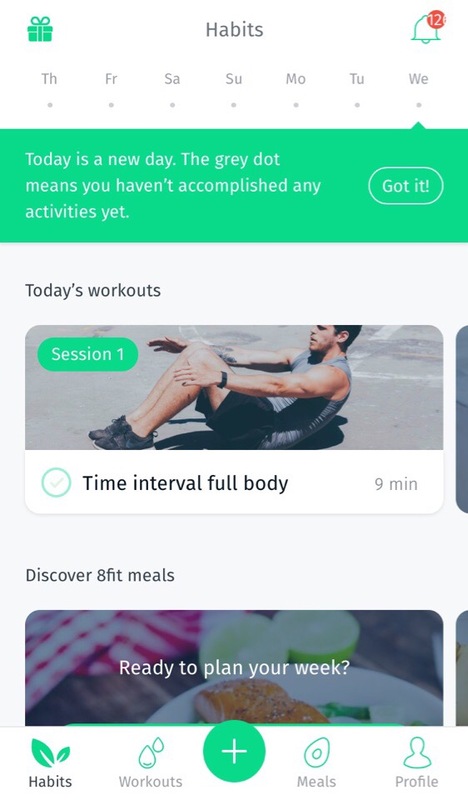 The user can also choose the time when it is convenient to do exercise — 8Fit himself will send a notification reminder to exercise at a set time. On average, one training 8Fit takes nine minutes. During this time, the user performs various exercises, from pushups to the crossing of the legs at a height of 45 degrees. Each of them have to do 10 times in one approach. After performing one exercise, the user need only press a button on the screen to proceed to the next task. 8Fit can be downloaded in the Apple Store for free. However, to use some additional functions, for example, a more individualized meal plan or the more extensive list of physical exercises will have expensive to pay the most affordable purchase will cost 1,890 rubles. However, 8Fit even in the free version offers enough options and features to sports to forget about the passes to the fitness room.